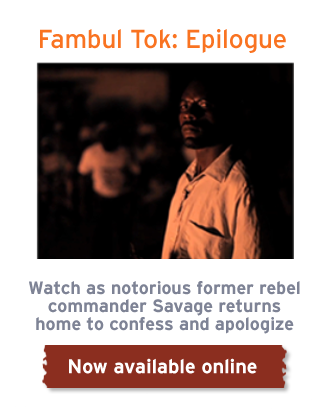 The movement grows – Fambul Tok screenings spread around the world. Fambul Tok available on Netflix. Fambul Tok wins awards in Rhode Island, Ohio and more. Students move forward with Fambul Tok clubs. © 2010 Catalyst For Peace . All Rights Reserved. Still photography © Sara Terry for Catalyst for Peace. Fambul Tok is a registered trademark of Fambul Tok ® International, and is used here with permission.